Growing up in Costa Rica, Luis Salazar and his family had many animals. Luis studied to become a veterinarian because that was his passion. After moving to the United States, he wanted to continue his dream to become a veterinarian, but due to the different country’s requirements, he would require many more years of schooling. This option did not appeal to Luis, so he turned to something else he was good at – fixing things. Luis Salazar is a technician for TransAm Trucking and has been for the past 11 years. Luis utilizes diagnostic tools to target problems in trucks and find solutions to get them running again. 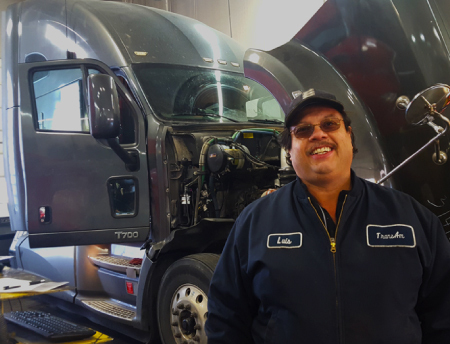 “I like fixing the trucks and assisting the drivers” Luis said. He spoke about how he has been able to grow as a technician throughout the many years and how TransAm has given him the opportunity to learn. When asked what advice he would share with new technicians getting into the field, Luis said, “Communicate. If you don’t know, ask.” Luis admitted that he does not always know how to fix something and said that communication is the most important aspect of his job. “Always communicate and find out the right way to do something.” Luis spoke about how the evolution of technology has been both good and bad throughout his years as a technician. He said that all of the changes in technology can bring on new problems and fixing those problems can be a challenge. It takes many hands to make a trucking company successful. For TransAm Trucking, it is individuals like Luis Salazar that has allowed us to become the company we are today. His noble dedication to repairing broken down trucks, assisting other technicians, and sharing his positive outlook on life has made TransAm Trucking a better company. Thank you, Luis, for being a part of the TransAm family!